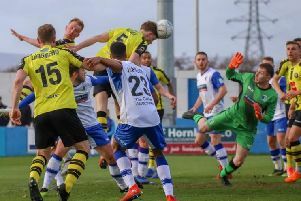 Harrogate Town’s Joe Leesley is hopeful that Tuesday night’s cameo against Barnet has done enough to persuade manager Simon Weaver to consider handing him a start at Barrow this weekend. 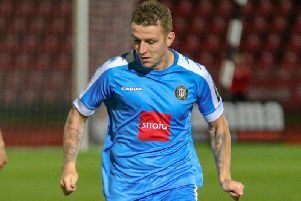 The left-winger came off the substitutes bench after 74 minutes of the National League promotion hopefuls’ 1-0 defeat and added an edge to a visiting attack that had struggled to create clear-cut chances prior to his arrival. Indeed, it was a Leesley delivery from a right-wing corner that led to Mark Beck almost grabbing a 94th-minute equaliser, the closest Town came to a breakthrough at any point. “I think I did alright,” he said of his performance. “With the length of time I’ve been out, it is hard [making an impression from the bench], but I think I made a bit of an impact and made a few chances from crosses. “I want to play every game and I’ll throw my hat in the ring for Saturday. I just want to get back to doing what I’ve been doing for the last 18 months. “I think I’ll always give the gaffer food for thought because I’ve been training hard and working hard, but unfortunately I don’t pick the team and I’ll always go by what he says. Town (6th) travel to Cumbria looking to bounce back from what was a first defeat in six in midweek, a result that cost them the opportunity to climb as high as fourth in the National League standings. They will be hoping for a repeat of the 4-2 victory that they recorded over the 11th-placed Bluebirds at the CNG Stadium back in October. Jack Muldoon, Josh Falkingham and Mark Beck were all on target that day, with an own goal completing the scoring. Barrow are however in decent form, winning all of their last three fixtures, two of which came away from home against Town’s play-off rivals Eastleigh and Wrexham. Ian Evatt's team have lost just two of their previous 10, though they've managed to win only three times in 10 home outings.